Chocolate fondue is the best choice, if you want to organize a party. Celebrate National Chocolate Fondue Day on February 5 dipping slices of fruit or cookies into chocolate fondue. Fondue as the dish originated in 19th century in Switzerland as a way to use and serve hardened cheese. The word “fondue” derives from French “fondre”, that means “to melt”, which is the best description for the process of turning cheese into viscous substance. Cheese fondue became popular in 1950s, but the chocolate dessert emerged in the 1960s. Sweet chocolate fondue is a great centerpiece for party. It's rich and luscious taste appeal to children and adults alike. The most popular dips for chocolate fondue are strawberries, banana slices and tangerines. You can also use cookie, small pieces of cake, pretzels or marshmallows to dip into hot dark or white chocolate. The secret of a good chocolate fondue is, of course, in its ingredients. Use only finest chocolate without vegetable oil. 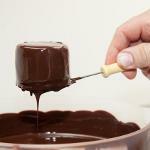 If is used in chocolate instead of cocoa butter, fondue will lack the taste and flavor of chocolate.